Lady Charlene "Char" Blanchard may have bloodlines that are the envy of every marriageable English miss, but she lacks the money to go with them. Raised by her aunt, her mother's half-sister who is an actress and aspiring playwright, after the deaths of her parents, Char would do anything to repay the woman who took her in, even if that "anything" includes secretly picking pockets to avoid being evicted from their home or attending a ball in the hopes of catching the eye of the very eligible Duke of Baynton. Jack Whitridge, younger twin brother to Gavin, the Duke of Baynton has not been seen nor heard from since he went missing from school at the age of 15...until the night he crashes the duke's ball just as Charlene has captured Baynton's attention. Of course, Charlene recognizes Jack immediately. He's the brash American who caught her picking the pocket of his associate, chasing her through the streets of London...and haunting her dreams since. But he's not the man she needs to focus on. She owes it to her aunt, a woman who has given her everything, to capture the heart of the Duke, not his twin. Jack and Gavin have always had a tenuous relationship, fostered by their late father. Gavin was the dutiful heir while Jack was the "less than" spare who strained to assert his independence. Living in America these past 15+ years has given him the distance and time to develop into his own man: a lawyer and American patriot. He's been sent to England in an attempt to avoid war between the two countries and needs Gavin's help to smooth the way with a British war office that views him as a traitor to the land of his birth. In addition to that, he hopes to reconcile with the family he loves and has missed. In order to do that, he must step aside and leave the path to Charlene clear for his brother. But Gavin, quite socially inept when it comes to women, keeps pulling Jack back into his courtship and into Charlene's sphere. Of course, the more time Jack and Char spend together, the closer they grow, until their initial attraction threatens to burst into a roaring flame. And the more Jack comes to know Char, the stronger he believes she's the right woman for him and not his brother yet his honor compels him to not pursue her...until Gavin does something close to unforgivable that changes the course for all three of them...and one more surprising character as well. 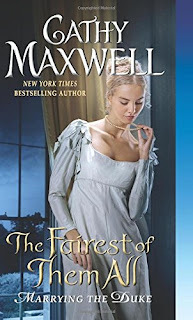 I think the Marrying the Duke series is one of Cathy Maxwell's best and I have thoroughly enjoyed the first two books as well as the prequel novella. Jack and Char are a wonderful match, kindred spirits, and I pulled for their happy ending throughout the ups and downs of their entire fast-paced, sometimes dangerous, journey. Though Gavin is smitten with Char and eager to propose marriage, it's clear to me that what he loves is the "idea" of Charlene, not the real woman. He sees only the carefully constructed facade that her aunt and godmother hope will capture his heart, not who she really is. And, while Gavin has now lost two potential wives to his brothers I can't feel bad for him because he has yet to know real love and he deserves to find that, hopefully in Maxwell's next book, A Date at the Altar, due out October 25th. Considering who his heroine is, I think this next book has the potential to be a rollicking good time! I've always enjoyed her stories - this sounds like another good one - thanks. I enjoy her books and am glad to see another good one come out. Thank you for the review. I like the heroine's name! ;) Thanks for the review! Love the cover on this - beautiful!